Lake was created by the lotus petals, which fell from the hands of Lord Brahma. 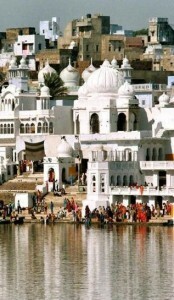 The lake is considered as one of the most sacred spots. It is called the Tirtharaj, the king of all Tirthas. It is believed that no pilgrimage is complete without a holy dip in the sacred lake at Pushkar. People say that one dip in the Lake on Kartik Purnima corresponds to performing yagnas for several hundred years.